Originally published under the title, "Turkey: "Zero Problems with Neighbors." 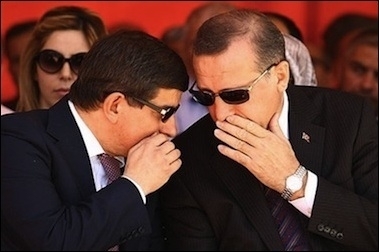 Turkish Prime Minister Ahmet Davutoglu (left) is the architect of Turkey's "zero problems with neighbors" policy, which ironically has led Turkey to have no ambassador in Israel, Egypt, Syria, Yemen, Libya, Cyprus and Armenia. President Recep Tayyip Erdogan (right) says he does "not mind [Turkey's] isolation in the world." In a speech in parliament on March 24, opposition leader Kemal Kilicdaroglu said that the government's "foreign policy has collapsed ... Turkey is entirely isolated ... For the first time in its history Turkey does not have ambassadors in four capitals [in its region]." Turkey is, in fact, the only country in the world that does not have ambassadors in all of Israel, Egypt, Syria, Yemen and Libya (in addition to Cyprus and Armenia). But there is more. With a 900-kilometer border with Syria, [Turkey] is hosting nearly two million Syrian refugees and is vulnerable to attacks and infiltration by the Islamic State. Tensions with both Iran and Israel have become deeply entrenched, and the country has become increasingly dependent on energy from a revanchist Russia. Indeed, while trying obsessively to topple Syrian President Bashar al-Assad, Turkey has created its own Peshawar (a restive, terror-stricken region of Pakistan) along its border with Syria by supporting various jihadist groups, at the price of suspicious (and belated) looks from its Western and NATO allies. U.S. politicians are realizing that Turkey has turned into an unstable, unreliable, authoritarian, and part-time friend. Additionally, after losing Syria, Iran, Lebanon and Egypt, Turkey has now lost Libya. In late February, Libya's internationally recognized government accused Turkey of sending weapons to Islamist groups in the country, and said it would stop dealing with Turkey. Libya's prime minister, Abdullah al-Thinni, did not even resort to any diplomatic language: "Turkey is a state that is not dealing honestly with us. It's exporting weapons to us so the Libyan people kill each other." A few days earlier, al-Thinni's government had said it would end all contracts with Turkish companies. That means a loss of billions of dollars worth of business, mostly for Turkey's construction companies. Against that backdrop, more U.S. politicians are realizing that their country's old staunch ally, Turkey, has turned into an unstable, unreliable, authoritarian and part-time friend that has the habit of sending shipments of arms to Middle Eastern radical Islamists. Erdogan's response was typically Erdogan. He accused the U.S. Congress of being "for hire." Turkey's pro-Erdogan media claimed the U.S. senators who signed the letter had been bribed.